Southern Illinois University Edwardsville sophomore Macey Brown, of Pekin, has achieved an honor not many undergraduates can boast. 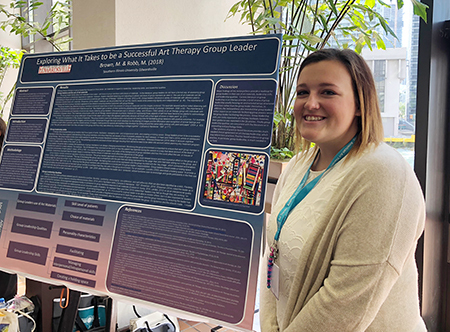 Brown earned Best Undergraduate Research Poster Award from the American Art Therapy Association (AATA) during their Nov. 3-4 national conference in Miami. Brown is double majoring in art and psychology. Thanks to SIUE’s unique Undergraduate Research and Creative Activities (URCA) program, she has had the opportunity to pursue a novel research project alongside faculty mentor Megan Robb, MA, ATR-BC, graduate program director for art therapy counseling. According to Robb, the URCA program is a gateway for undergraduates to work alongside research mentors in order to increase an understanding of what research is and how to conduct it, and to develop critical thinking skills. Brown secured the only undergraduate poster award presented by the AATA. She enjoyed the opportunity to meet and learn from art therapists from all over the world. Photo: SIUE sophomore Macey Brown earned the Best Undergraduate Research Poster Award from the American Art Therapy Association.